MISTAKE No. 1: Choosing a carpet cleaner based on equipment alone. MISTAKE No. 2: Choosing a carpet cleaner based on low price. MISTAKE No. 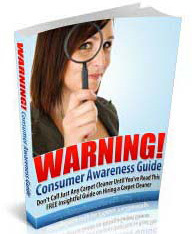 3: Choosing a carpet cleaner based on a single telephone call. MISTAKE No. 4: Choosing a carpet cleaner who doesn’t offer a money-back guarantee. MISTAKE No. 5: Choosing a carpet cleaner without getting comments from his other clients. Any carpet cleaner can say anything about his past jobs and, sadly, some of what he says may not be true. Make sure you ask for references or read comments from current customers so you can depend on the carpet cleaner and his work.